“Gold farming” and “real-money trading” (RMT) are – respectively – the production and sale of online game virtual goods or services for real money. They consist mainly of making and selling the virtual currencies used in games such as World of Warcraft; or of creating and selling powerful characters in those games (“power-levelling”). Pre-History: first sales of virtual game items occurred during the 1980s and 1990s, building to a largely US-based cottage industry in which individuals made the equivalent of pocket money. Golden Age: from the late 1990s to mid-2000s, gold farming was a sector of super-profits as the number of online game players expanded rapidly, as eBay emerged to facilitate trading, and as production shifted to low-cost locations in Asia. The result was creation of tens and then probably hundreds of thousands of new jobs, with the virtual currency and power-levelling services being sold to game players in the US, Europe and within Asia itself. Backlash and Beyond: from the mid-2000s, game companies began clamping down on what they saw as illegal activity, yet simultaneously new gold farmers and traders began flooding in. As a result, gold farming profits were cut and it became a difficult and risky activity, though one that still appears to be growing despite the global economic crisis. Non-purchasing players, game companies, and many Western commentators have built a chorus of disapproval against gold farming. They try to brand it as illegal, exploitative, and linked to organised crime. Although the evidence base on gold farming is much too limited, work at the Centre for Development Informatics seeks to show there is an alternative, developmental perspective. Gold farming and RMT show novel ways in which ICTs can create new income streams for developing countries, new jobs (some for unemployed rural migrants), and new skills. They may also be the early sign of a new business model for developing countries – “cybersourcing” – the outsourcing of activities that take place entirely within the virtuality of cyberspace. Other examples would be welcome . . .
I’ve entered the ITU data on broadband penetration for all countries from 1998-2008 into a Google Docs spreadsheet, and then added the Motion Chart visualiser. The screenshot below gives an example. 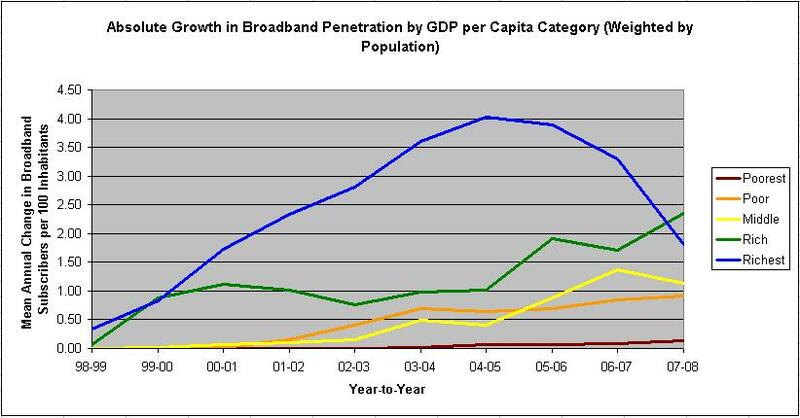 Also given below are two screenshot summary graphs derived from overview data about diffusion rates for broadband, which can be found at: http://spreadsheets.google.com/pub?key=tCyqBGWg0E8qg6qG77ltZ2g&output=html. The most useful statistics are absolute growth rates (weighted by population), which show growth having peaked in 2005 for the richest fifth of nations, but generally still rising for the others. 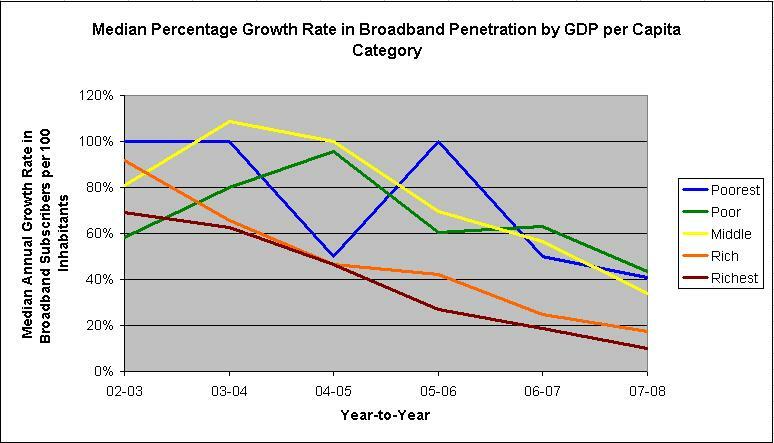 The percentage growth rates have been steadily declining, but mainly because those growth figures are insanely high in the first few years of broadband diffusion given the very low base they start from. 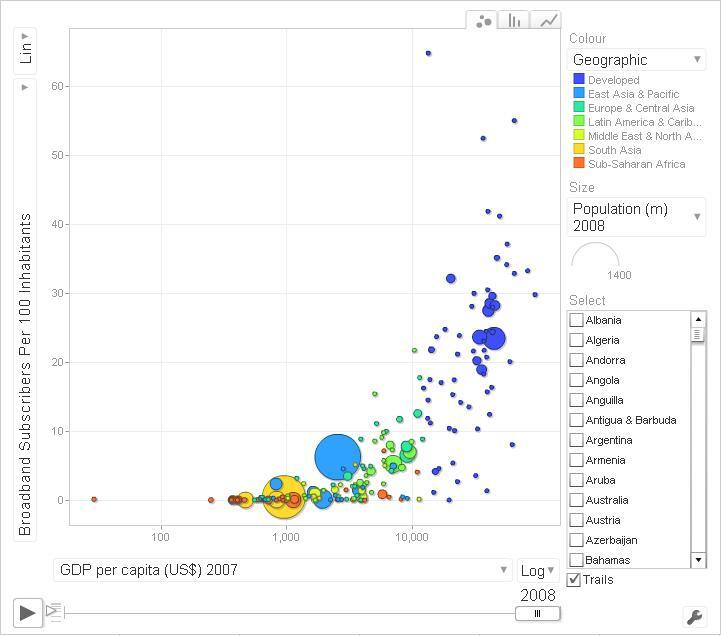 You can find similar visualisations that you can cross-match with a host of other data categories (demographics, economic/social development, and ICT diffusion) using World Bank data (http://devdata.worldbank.org/DataVisualizer/) or a graph I’ve created at Gapminder: http://bit.ly/78IWkN. But these don’t go up to 2008, and you can’t see or access the underlying data. Note the dynamic visualisation charts will not show up on slower PCs or Internet connections.